A fast car with a sticky set of tires doesn’t make someone a better driver. Spend a few minutes searching YouTube and you’ll find proof in the form of BMWs that drive off a twisty California mountain road, or Ford Focus STs that drift into a hill. 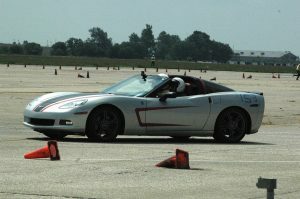 There are much better ways to sharpen your skills behind the wheel, but there’s none more attainable than a ¾ mile road course set up by a local volunteer-run organization such as the Champaign County Sports Car Club. Dean Plumadore knows a thing-or-two about such matters. As president of the CCSCC, he’s letting his passion for motorsports serve as a recruiting tool for new drivers. Dean admits he’s relatively new to the sport, but that hasn’t stopped him from receiving a fair amount of accolades and hardware for his skills on the skidpad. Dean’s self-described ‘piloted land missile’ of choice used to be an Infiniti G37, which he enjoyed for many years. Today, he’s graduated to a 2008 Chevrolet Corvette with some tasteful modifications. 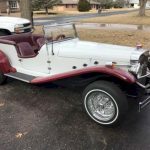 This silver coupe with a killer set of stripes, rim and tire package, Magnaflow exhaust and a T-56 manual trans is well known around central Illinois. Just take a peek at how he navigates this course and you’ll see why. 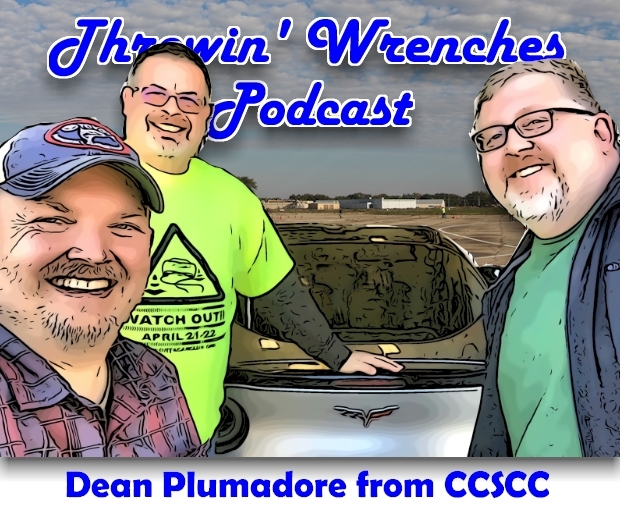 This week, we talk with Dean about race cars, track safety, and why everyone should spend some time behind the wheel on a road course to become a better driver. 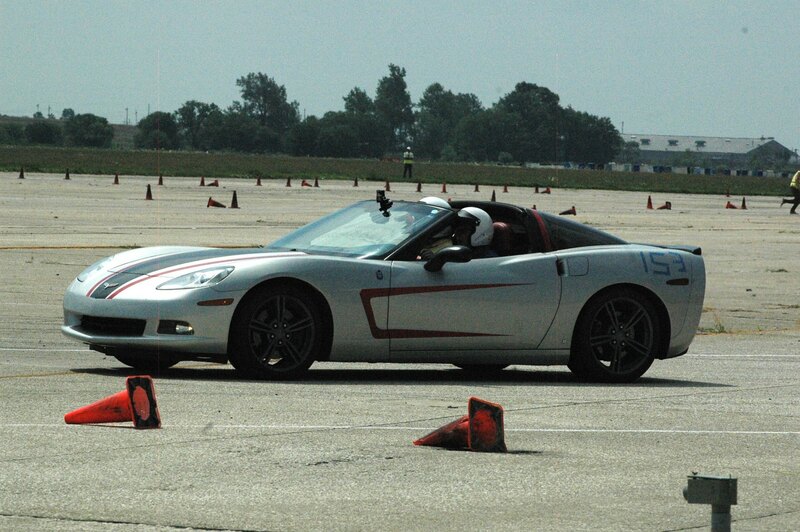 For more information about Dean or the Champaign County Sports Car Club, visit them on their many channels. Eric also needs to sort a massive squeak on Tree Hugger and give the Celica a plasti-dip bath before the first autocross of the season. Daryl replaced the starter in the Tahoe after it gave up the ghost. It seemed to short out after an undercarriage wash at a Hucks’ gas station car wash, but it may have just been time. It shouldn’t shoot out shards of metal that look like steel wool, should it? Dean offers some handy tips for troubleshooting auto electrical gremlins based on a classic lesson in “horses vs zebras” last fall when his ‘Vette wouldn’t start. 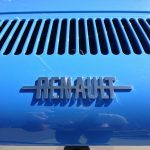 Reports suggest that Renault wants a merger with Nissan and will seek to buy Fiat Chrysler according to CNBC. Renault is reportedly looking to restart merger talks with Nissan within the next 12 months before making an attempt to buy Fiat Chrysler. A combination of Renault, Nissan and Fiat Chrysler would be viewed as a viable rival to the current global auto leaders, Volkswagen Group and Toyota. Renault, Nissan and Mitsubishi are not officially merged but all three carmakers operate a partnership under a complex arrangement of cross-party share ownership, according to the report. Electric Vehicle sales in Europe are up 36% year over year. The top seller? Tesla’s Model 3, followed by the Renault Zoe and Mitsubishi Outlander electric. Are pre-production Corvettes really snapping in half? Several alleged reveal dates for the eighth-generation “C8” Chevrolet Corvette have come and gone, and a new report claims that this has been due to design problems delaying the new model’s launch. These complications have apparently been so major, in fact, they’re causing damage to the car’s frame and glass engine cover due to too much power for the chassis. 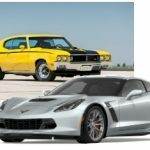 Prototypes fitted with twin-turbo V-8s producing between 900 and 1,000 horsepower have reportedly suffered from structural distortion so severe that the engine compartment glass hatch was breaking. These are in line with previous rumors which claimed that the C8 will use a twin-turbo V-8 to achieve hypercar-like performance, with acceleration so “frightening” that GM has supposedly consulted with lawyers about the potential risk of selling something so fast. Dean counters that GM is pushing the envelope with this new Vette platform. We’re glad GM is doubling-down on the next generation of America’s original sports car. Two Illinois State Police officers were killed in the past week after motorists crashed into them during a traffic stop. (Trooper Gerald Ellis was originally from the Macomb area, and moved to the northern suburbs.) He was killed by a driver going the wrong way on the Tri-State Tollway at 3 in the morning. 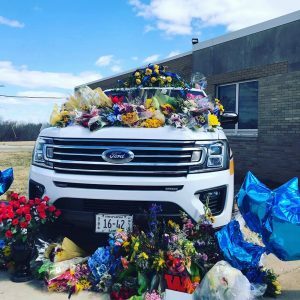 Ellis’ death is the third involving a State Police officer and the 15th crash since 2019. Trooper Brooke Jones-Story was killed this week while inspecting a tractor-trailer on US 20 in Freeport when another semi slammed into her. Authorities are reminding the public to follow Scott’s law, which calls for motorists to reduce speed and move over when approaching an emergency vehicle or face a $10,000 fine. Some proposed changes to the law have also been floated, including a proposal by State Rep. Ryan Spain of Peoria to levee the fines even higher. Other states such as Wisconsin take things a step further and actually suspend driver’s licenses for similar offenses. Does that really make a difference? Elon drops a new single. No joke. Testing a starter or alternator at your local auto parts store in 2019 kinda blows. Eric: 1929 Mercedes replica with 12 miles on the odometer. Built on a square stock chassis with a 4 cyl Ford & manual trans, this is a fun kit car that hasn’t been driven much. 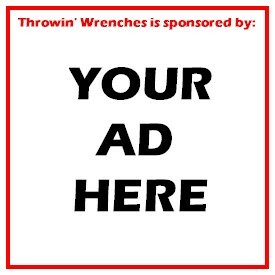 The ad says it needs card work (or is that CARB work?) Is this one of those cars that’s more fun to look at, than drive? Daryl: Sam Leman Ford has this beautiful 1971 Chevy Monte Carlo on their used lot. (Leman dealers occasionally come across some clean collector stuff once in a while.) Finished in its original Sandalwood lacquer over a classic 70s buckskin vinyl interior, this small-block equipped coupe is ready for the open road. These ride on the Chevelle chassis, so everything is readily available. Not a bad buy for $18,988. 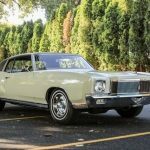 Dean: Since his first car was a 1968 Buick, Dean always liked the GM muscle cars of the late 60s and early 70s, such as the Buick Skylark GSX. He also appreciates the new muscle that’s packed under the hood of the C6 or C7 era Corvette ZO6’s. Why not buy both? Be sure to download, like, share and all that fun stuff. Outstanding guest! Thanks again Dean!